31 Wonderful Hours at Corona Library! Our excited customers gather outside Corona Library to learn more about the schedule for the 31-Hour Open House. Our 31-Hour Open House at Corona was a great success! The Open House, part of the Queens Library is for Everyone campaign, was an opportunity to see the programs and services the Library has to offer. We wanted to open Corona for 31 straight hours so the community could experience everything we had to offer. 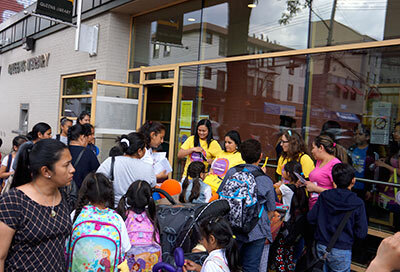 The Open House started on Friday morning, June 2, when Queens Library President and CEO Dennis M. Walcott spoke to our customers and let them know all the great activities we had scheduled. He then read “A Color of His Own” during a special Toddler Story Time session. “Already, the library is hustling and bustling. It’s alive with energy,” he said. 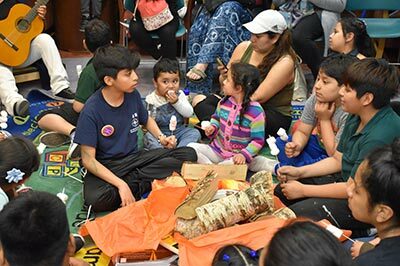 From experts talking about community safety and how to help immigrants, to a library "bonfire" where families sang and told stories; from late-night music and dancing to early-morning yoga (with President Walcott! ), and much, much more, there was something for everyone during all 31 hours of the Open House. Songs and stories at Friday night’s "bonfire" in the library. As the saying goes, “Everyone has a library story,” and our customers enjoyed experiences that you can only find at the Library. For instance, over 30 people joined us for a game of Bilingual Family Bingo Friday night. Children and their families got to welcome Saturday morning with songs, dancing, and stories—in their pajamas! One woman came all the way from Brooklyn to use one of our free computers, and stayed even longer to enjoy herself. And at our final event, a poetry reading with Queens Poet Laureate Maria Lisella, even 10-year-old Leia Stea and her nine-year-old sister Maria shared their poems about tolerance and accepting people for who they are. 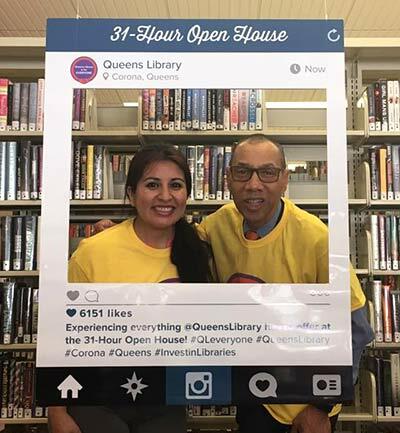 Gianina Enriquez, Vice President of the Friends of Corona Library, and Queens Library President and CEO Dennis M. Walcott show off one of our special Instagram frames. Thank you to the staff at Corona Library and all the Queens Library departments that put in the extra work and time to make sure everything went smoothly, as well as the staff members who worked extra shifts during the Open House. Thank you also to the Friends of the Corona Library for their support, including board members Christina Camacho, Rosalba Rosas, Gianina Enriquez, and Yamile Pena. You can see more pictures from the 31-Hour Open House at the Gallery Page.